Happy New Year to all the readers of Methane International and the GMI community! 2016 was an exciting year for methane-related news, and the end of the year was no less interesting, so let’s recap the latest in methane. Two new studies build upon the world’s understanding of the atmospheric methane cycle and changes in methane accumulation. The first, published in the journal Earth System Science Data, outlines the global methane budget over the 13-year period from 2000 to 2012. A consortium of researchers under the Global Carbon Project have produced a biennially-updated assessment of global methane concentrations and an analysis of known sources and sinks (sinks are natural features that neutralize methane as a GHG by breaking down CH4 molecules or absorbing the gas back into the earth’s surface). This has allowed them to quantify a global atmospheric balance of methane emitted and methane destroyed or absorbed. The difference in the balance reveals the rate of accumulation (see infographic below). While providing a confident scientific estimate of total methane over the years in question, the research team expresses a high degree of uncertainty in attributing the quantities of methane emitted into and depleted from the atmosphere, stemming primarily from the geographic overlap of diffuse sources and the effects of natural phenomena on the cycle. However, more certainty exists in their understanding of human-induced sources than natural factors, which provides assurance for those who work to mitigate anthropogenic emissions. Read the study abstract and a find a link to the full article here. A second study, from the journal Environmental Research Letters, is entitled “The growing role of methane in anthropogenic climate change.” In it, researchers show that while the growth rate of global CO2 emissions is slowing, the growth rate of CH4 emissions has been increasing over the last decade, causing rapid methane accumulation in the atmosphere. This study complements the one above by providing several more recent years of analysis. The researchers estimate that methane concentrations in 2015 reached 1,834 parts per billion (ppb), up from ~1,775 ppb in 2005 when growth rates were flat. However, as in the above study, they also indicate a significant problem in more precisely identifying prime contributors due to the acknowledged uncertainty in the global methane budget. The analysis is able to offer evidence that points to anthropogenic sources as the prime contributor – outlining increases primarily in agricultural and fossil-related emissions while showing that natural wetland emissions have remained stable – but the researchers concede that more attention needs to be paid to accurately quantifying and geographically partitioning the various factors of the budget. The study provides strategies for reducing uncertainties in the methane budget and highlights mitigation opportunities as well. Together, these studies highlight the work that has been done to develop the methane budget as well as the work that is still needed to address the uncertainties of this important basis of knowledge in the fight against climate change. The fact that so many scientists are working together and focusing their efforts on understanding methane emissions demonstrates the growing understanding of the mounting threat that CH4 poses to climate change as the second-most abundant GHG. Their findings are critical to informing and guiding mitigation action groups, such as GMI, and we wish them continued success in bringing the global picture of atmospheric methane changes more clearly into focus. As UN negotiators headed to Morocco for COP22 in November to hammer out the rules of last year’s Paris Climate Agreement, a bit of good news greeted them: for the second year in a row, global GHG emissions appear to be unchanged, despite increased global economic output of around 3%. Normally only economic recessions have caused GHG emissions to halt in their historically steady upward climb, but according to a study by a huge research team at the Global Carbon Project and the University of East Anglia, anthropogenic emissions in 2016 are projected to increase by only 0.06% over 2015 (with room for error, they are essentially unchanged). 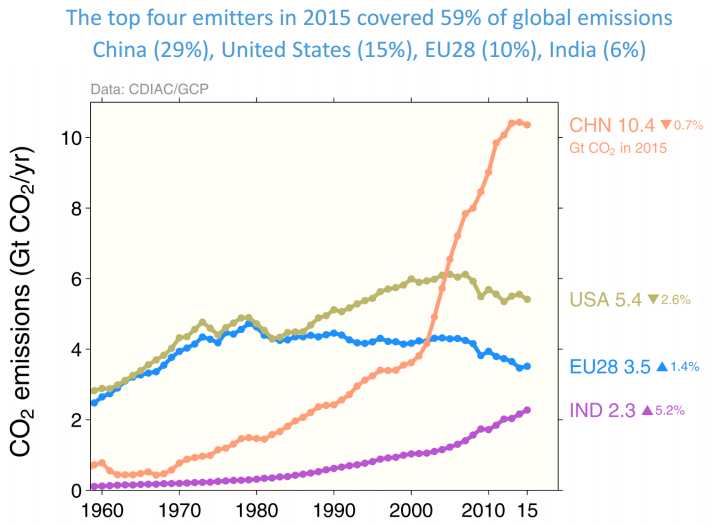 The study shows decreasing emissions from China and the United States, the world’s first- and second-largest GHG emitters, respectively, as the primary factors holding global emissions level. The fact that both nations have experienced steady GDP growth in 2016, a projection of 6.7% for China and 2.5% for the United States, lends weight to the argument that GHG mitigation actions are not necessarily harmful to economic growth. However, GHG emission increases in developing nations and in the European Union offset the China and U.S. reductions, preventing the year 2016 from seeing global decreases overall. While two years of unchanged global GHG emissions is good news, it should nonetheless evoke a sense of caution. Two years does not a long-term trend make, nor is it a downward trend that is necessary to make serious headway against severe climate change impacts. Vast amounts of GHGs are still accumulating in the atmosphere year over year. It is encouraging to have evidence that global mitigation efforts are starting to work, but that evidence also serves as a reminder that our efforts must continue and intensify to produce further momentum in the right direction. The work of GHG mitigation and research groups like GMI, the Climate and Clean Air Coalition (CCAC) and Global Carbon Project is just as relevant and imperative as ever. Henry Ferland, co-director of the GMI Administrative Support Group, recently undertook a new position as the International Coordinator for EPA’s Office of Air and Radiation. In this role, Henry will have a broader international portfolio, helping to coordinate visitors and activities for a myriad of different agreements and relationships that include climate, air quality, and/or radiation issues. Henry has worked at EPA for nearly 25 years, including more than a decade supporting GMI (and its predecessor Methane to Markets). His expertise and contributions to the Initiative will be sorely missed, but we wish him all the best in his new endeavors. Carey Bylin leaves EPA after nearly 12 years of service to its oil and gas voluntary programs. Some noteworthy achievements include contributing to the design and launch of two new oil and gas partnerships: EPA’s Natural Gas STAR Methane Challenge Program and the Climate and Clean Air Coalition’s Oil and Gas Methane Partnership. These voluntary programs leverage collaboration with oil and gas companies, national governments, and other stakeholders to reduce methane emissions. Carey was also a member of GMI’s Oil & Gas Subcommittee and led a series of successful projects during her tenure at EPA. We wish her well at the California Air Resources Board where she will continue to support climate change efforts. 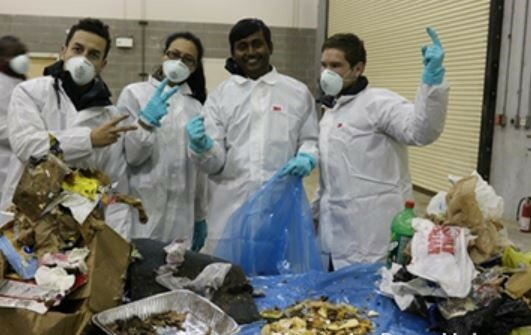 Nick Elger joins GMI after a stint as an ORISE Fellow with EPA’s AgSTAR and Landfill Methane Outreach Program. Nick brings international biogas experience from his time at the University of Minnesota where he worked with communities in Nepal to identify funding opportunities for small-scale biogas systems. He will be working with the Biogas Subcommittee to support program implementation in that sector. We are very excited to welcome Nick to the GMI team.